Johnson City is a beautiful city in Tennessee. On average, the city gets about 4 inches of precipitation per month. This may not seem like too much, but when your business is not protected as it should be, those 4 inches may end up in the basement. This renders your building vulnerable to the growth of mold and mildew. The pressure that the rain and snow puts on your foundation is quite strong, causing cracking and shifting of your foundation walls and floors. This could also leave your building breaking down and cracking, which can cause foundation and structural problems. Therefore, the safety of your business and the value of your company decreases. In the end, protecting your business against the unpredictable is of top priority. Atlas Piers can help save your business from all these problems by providing commercial foundation repair Johnson City Tennessee. When and if you notice these signs in your Johnson City business, don’t fret. Just simply pick up the phone and call us at Atlas Piers. There is no reason to wait on foundation repairs, in fact, catching signs early can help, and it is best to keep your building as safe and secure as possible. Your business is a huge investment, and we plan on helping you keep its foundation in great shape. This will keep the value up and your company safe. As you decide to invest in the necessary commercial foundation repair in Johnson City, TN, remember that Atlas Piers will outline a plan that will meet your needs. In the plan we use only the very best products on the market made by Earth Contact Products (ECP). Whenever you have any kind of settling problems, we will use helical piers or steel push piers to add the extra support needed for your foundation. If we have found bowed walls or leaning walls we might add carbon fiber sheets to increase stability and strength and know that you are using a product that kind to the environment. 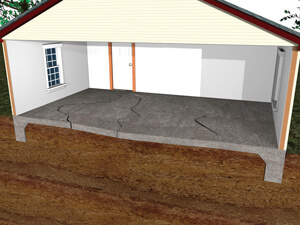 Atlas Piers knows how to do foundation repair in Johnson City, TN and you will have the confidence of a safe structure once again. So no matter what solution your business needs, we can help you with it. Whether it be a cracking basement wall or a settling foundation, we have you covered. Call Atlas Piers of Atlanta, your commercial foundation repair Johnson City Tennessee team.